It pains us to do it, but it’s for a worthy cause – our appetites. In short, we’re going to carve out one of our amazing Tuscan Boules. In technical kitchen terms that’s called “repurposing the recipe”. At Grace Baking we stop before bend becomes break and so we’ve created this Cheesy BLT Boule with measured unconventionality, but unbridled taste. Think of it as a self-contained dip & dish. The best part there’s nothing to clean up. 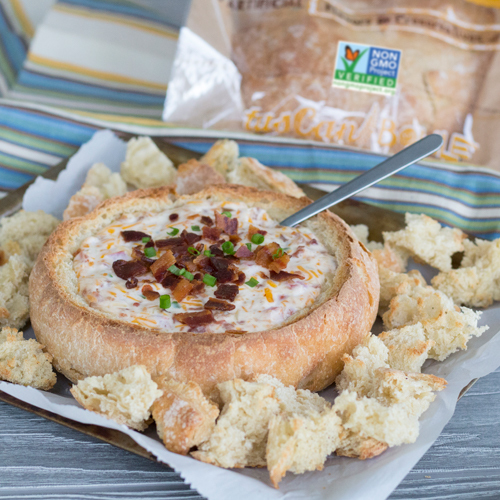 The secret is in our Tuscan Boule – it’s bowl-shaped, and so perfect for filling with a tangy cheese dip. Tuscan Boule, dip, and whoever does the dishes never had it so good. Bring a few friends, because this is not a recipe designed for leftovers. Preheat oven to 350°F. Cut the top off the boule. Dig out the bread inside making sure to leave a ½-inch wall around the sides and bottom. Tear the removed bread into bite-size pieces and arrange pieces and empty boule on a baking sheet and toast until lightly browned (approximately 10 minutes). Remove from oven. Transfer croutons to a serving dish and set aside. Leave toasted boule on baking sheet. In a large mixing bowl, combine mayonnaise, sour cream and cream cheese and mix thoroughly. Add crumbled bacon, Pepper Jack cheese, tomato and chives, and mix well. Spoon the mixture into the bread boule and bake for 15-20 minutes, or until the cheese is melty and cooked through.